This was really an unusual book for me to pick up, and to be honest if you had told me a couple of months back that I would have read it, I would probably have laughed. I did go through a phase a few years ago where I was very much into reading biographies, but I haven’t picked one up in quite a while – and this is certainly the first biography of a sporting personality that I have tried (my choices previously inclined towards historical figures and writers). So what inspired me to pick up Bradley Wiggins’ autobiography? Well, undeniably there was the wave of post-Beijing euphoria that was sweeping the country that piqued my interest, and I had found track cycling in particular to be a surprisingly exciting sport to watch in the BBC’s Olympic coverage. Then there was a fascinating interview with Bradley that I read in a weekend edition of The Times. I would normally gloss over such pieces, but I found myself being drawn into the article and finding out that Bradley the serious sportsman was also Brad the entertainer, a man who could convey the passion he felt for cycling in a lively and articulate way. By the end of the article I had resolved to hunt out his biography “In Pursuit of Glory” the next time I was in my local library. By all reasonable measures, I suppose a ghost-written biography with an all-too-obvious title on an incomplete sporting career rushed out on the back of an Olympic campaign should have been pretty awful, but I was hopeful that the Brad who came across in the article I read would also be apparent in the book. The result, I found, was somewhere between the two extremes; there were times when the book did feel rushed and a bit incomplete, but other parts were exciting, exhilarating and entertaining. 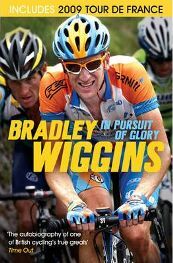 Opening to a late night phone call from cycling coach Shane Sutton shortly before his Beijing campaign began, the calm of the Wiggins household is shattered as Bradley learns of the admittance of his estranged father to a hospital in Australia with a potentially serious condition. The effects of his father – professional cyclist Gary Wiggins – hang heavily over many of the events in this book, as although he left his son at a very young age after a volatile relationship with his mother and met Brad on only a handful of occasions thereafter, he seems to have had an unduly large impact on his life. Indeed, Gary is discussed far more in this book than Brad’s supportive and loving mother; it seems that his desire to win in cycling is driven as much by a need to prove something to his absent father as it was inspired by the success of Chris Boardman at the 1992 Olympics, a pivotal event he describes seeing as a child. Indeed, Gary’s much-discussed tendencies to go off the rails and drink heavily are also apparent in the section where Brad opens up about some of his own personal and psychological issues. There are many sections in the book where Brad is “let off the leash” after training for a big event and responds by getting plastered – including a bender that lasted several months after the Athens Olympics. While this may raise a few points about the nature/nurture debate, reading about people going out and getting drunk is hardly stimulating in any context, and I found these parts of the book a little tiresome towards the end. It felt to me that Brad hadn’t been quite as open and honest with his ghost writer as he could have been, like he was holding something back, and his constant need to justify his heavy drinking sessions suggests he is not as comfortable with them as his laid back attitude may suggest. Aside from Gary leaving, the events of Brad’s childhood are covered only too briefly as he is more interested in discussing his later successes; while this is I suppose understandable, I find that this is the key area of the book that suffers from rushing. Personally, I love to read of the childhood and growing-up experiences of people in biographies, as these are the times that shape us. I love to find out just how someone has become the person they are. In the case of highly successful people, I want to know just what individuals did early on to make themselves exceptional later on in life. While I did learn a little, I would have liked a bit more than the “inspired by seeing Chris Boardman win gold, bought a bike, joined a club, started winning stuff” account that was crammed in to two short chapters with a couple of pictures. Still, it was quite interesting stuff, and I found the sections that followed a little dull in comparison as they formed little more than chronological accounts of Brad winning races. Things pick up a bit when we reach the section on his experiences on the Tour de France, where he rode professionally in two controversial tours (2006 and 2007). Admittedly I know absolutely nothing about road cycling and have only a hazy awareness of the tour, but this section of the book is about an event that Brad clearly loves and it is hard not to become enthused by his passion as he describes what it is like to achieve one of his career ambitions. It is also interesting to hear of how such events are organised and what it is like to compete on them – I found his day in the life of a tour cyclist particularly interesting. The final chapters of the book are what most people will have picked it up for though: Brad’s account of the Beijing Olympics and how he won his two gold medals (in the individual and team pursuits). If it is interesting to read what goes on behind the scenes of a sporting event you know little about, it is fascinating to be taken backstage at the Olympics. To the casual viewer of such events, this book really brings home just how much effort, dedication, precision training and emotion goes into the brief appearances that win medals. In regard to the writing, I thought the standard was decent throughout the book and the quality was especially good when describing the details of races, which are exciting and engaging. I was pleased to see the book supported by a glossary of cycling terms that helped make sense of things for those of us who are less than knowledgeable about this sport (it helped to clear up my bemusement at what was going on in a Madison race at the very least) while not interrupting the flow of the prose. However, again I will return to the idea that parts were rushed: there were some sections here the same word was unnecessarily repeated over a short space and others where typos remained, suggesting it was written quite quickly and not given as much editorial attention as you might expect. There was also the odd technical term that didn’t make it into the glossary, which niggled a bit but didn’t cause any major problems in comprehending the text. The overall language was therefore fairly accessible and I would have thought it appropriate for mid teens and upward. To sum up “In Pursuit of Glory” is quite tricky; there are some sections I want to rate as five star, and others that deserve no more than two, some parts I want to recommend and others I don’t. It was for the most part an enjoyable read for me, although it didn’t sustain my interest from cover to cover. Those of you with an interest in the Olympics, and in particular the amazing success story of the British cycling team, would probably find it worth dipping in and out of, so I think it is perhaps fair to give it 6 out of 10 overall and a recommendation as a library or cheap paperback read – I would only recommend buying it in hardback for true cycling nuts. I do hope that Brad goes on to compete in the London 2012 games and that he uses the experience of it to feed back into a revised version of this book that does cover the whole of his sporting career and gives a more complete picture of the man overall. Now that just might be a five star read. No Comments on "In Pursuit of a Good Read"